This name uses Spanish naming customs: the first or paternal family name is Farfán and the second or maternal family name is Guadalupe. Commonly known as Farfán or the nickname Foquita (Spanish for Little Seal), he is known for his speed and technical ability and was one of the best providers of assists during his time in the Bundesliga. Farfán began his professional career with Alianza Lima of Peru, with whom he signed in 2001. Although he made some appearances on the first-team in 2001, Farfán only began to break through in 2002, becoming an impact player and helping Alianza win the Peruvian championship in 2003. In his final season with the club in 2004, Farfán scored 14 goals, helping the club to another Peruvian championship. Following that season he was purchased by Dutch club PSV Eindhoven after being scouted by Guus Hiddink, for a reported 2 million Euro transfer fee. On 5 June 2008, it was reported that PSV had reached an agreement with German side Schalke 04 over the transfer of Farfán for around €10 million. On 10 June 2008, the club officially confirmed the transfer of Farfán on a four-year contract. On 28 April 2012, Schalke announced that Farfán had signed a contract extension, which would keep him at S04 until 30 June 2016. On 20 July 2015, after seven years at the club, Schalke confirmed that Farfán had joined Al Jazira Club for a reported fee of €6 million on a three-year deal, where he could earn up to €10 million a year. Farfán left the club on 19 October 2016, because the club did not respect all the clauses in his contract. On 28 January 2017, he signed with the Russian Premier League side FC Lokomotiv Moscow. The Russian team announced his signing after an irregular 2016, where he even was inactive for a hundred days after finishing in October 2016 a millionaire contract with Al Jazira. After 6 months of recovery, Farfán had a good season making goals that allowed his team to get the national title after 14 years. Farfán is an important player for the Peruvian national team. Since making his debut for the side in February 2003, he has gained 90 caps and is fourth on the nation's career goalscoring list with 26 goals. Farfán ended the South American 2006 World Cup qualifiers as the second top scorer, with seven goals. He was suspended for 18 months from representing the national football team of Peru. But on 3 July 2008, after an investigation and a review of the facts, the suspension was changed to three months (from the date of appeal in April 2008) and $10,000. Farfan scored the winning goal in the World Cup qualifier at home to Chile on 23 March 2013. He was a member of the Peru national football team that finished in third place at the 2015 Copa América. Farfán has been a key performer for Peru during the 2018 World Cup qualifiers where he scored 3 goals. He scored 2 goals in a 3–4 home loss to Chile and the winner in a 1–0 home win over Paraguay. He scored one of two goals in a 2–0 home win against New Zealand that led Peru qualify to the 2018 FIFA World Cup after a 36-year absence. In May 2018 he was named in Peru's provisional 24-man squad for the 2018 FIFA World Cup in Russia. Farfán is considered as a fast forward or winger, and regarded less as a goal-scorer, but more as a creator and assister of goals. His one-on-one dribbling ability, accurate corner kicks and passes contributed heavily to Schalke's goals, especially in the international arena. 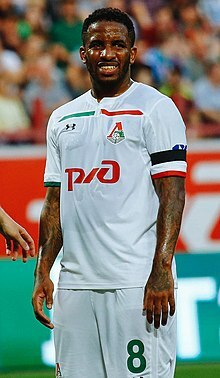 Farfán is also known for his penalty kick and direct or indirect free kick ability. Scores and results list Peru's goal tally first. Farfán has three children; two sons and one daughter. ^ "2018 FIFA World Cup: List of players" (PDF). FIFA. 21 June 2018. p. 21. ^ "Farfan, Jefferson" (in German). kicker.de. Retrieved 15 March 2011. ^ a b c Talib, Hassan Haji; Schumano, Alex (10 April 2013). "Why Jefferson Farfan is Schalke 04's Most Important Player". ftbpro.com. Archived from the original on 6 September 2014. Retrieved 6 September 2014. ^ "Municipal se enfrenta al Al Jazira por la "Foca" Farfán". Terra (in Spanish). 29 August 2015. Archived from the original on 4 March 2016. Retrieved 9 September 2015. ^ "Rutten haalt met Farfán eerste aanwinst naar Schalke 04" (in Dutch). Voetbal International. 5 June 2008. Retrieved 17 August 2008. ^ "PSV's Farfan joins Schalke 04". FIFA.com. 10 June 2008. Retrieved 17 August 2008. ^ "Jefferson Farfan bleibt ein Schalker – Peruaner unterschreibt bis 2016" (in German). schalke04.de. 28 April 2012. Archived from the original on 2 August 2012. Retrieved 18 July 2012. ^ "Jefferson Farfan passes medical as Al Jazira move near completion". ESPNFC. 20 July 2015. Retrieved 23 July 2015. ^ "Jefferson Farfán no va más en el Al Jazira". peru.com. 19 October 2016. Retrieved 21 October 2016. ^ Джефферсон Фарфан – в «Локомотиве»! (in Russian). FC Lokomotiv Moscow. 28 January 2017. Retrieved 30 January 2017. ^ "Jefferson Farfán". fclm.ru. Retrieved 16 May 2018. ^ "Peru's Del Solar says he won't resign over hotel party scandal". International Herald Tribune. Retrieved 17 August 2008. ^ "Revealed: Every World Cup 2018 squad - 23-man & preliminary lists & when will they be announced?". goal.com. Retrieved 17 May 2018. ^ Hassan Haji Talib (21 November 2012). "Jefferson Farfan: Von der Skandalnudel zum Musterprofi" [Jefferson Farfan: From scandal guy to model professional]. goal.com (in German). Goal.com. Retrieved 6 September 2014. ^ "Farfan beschert Schalke mit einem Solo den 1–0 Sieg in Leverkusen" [Farfan brought Schalke with a solo to 1–0 win in Leverkusen]. Hamburger Abendblatt (in German). 24 October 2011. Retrieved 6 September 2014. ^ "Alianza Lima – Jefferson Farfán :: Sitio Oficial:". jeffersonfarfan.com. Jefferson Farfán Sitio Oficial. ^ "Jefferson Farfán". psvweb.nl. PSVweb. Archived from the original on 28 March 2012. Retrieved 28 July 2011. ^ "Jefferson Farfán » Club matches". worldfootball.net. Worldfootball. ^ a b c d e "Peru – J. Farfán Profile". soccerway.com. Soccerway. ^ a b "Jefferson Farfán". National Football Teams. Benjamin Strack-Zimmerman. Retrieved 6 September 2013. ^ "Jefferson Farfán estuvo en el nacimiento de su tercer hijo" [Jefferson Farfán was at the birth of his third child]. El Comercio (in Spanish). 16 May 2012. Retrieved 6 September 2014.